The responsibility for safeguarding children belongs to everyone. Children will only be safe if families, communities and professionals work together to promote their welfare. It is important that all members of the community understand that Child Protection is a concern for everyone and that effectiveness of professional agencies will depend on the awareness and support of the public. NSPPC National Child Protection Helpline 0808 800 5000 or click here for other options including text, e-mail and Sign video for the deaf or hard of hearing. 1.1.3 All children should be safe and able to develop to their full potential. The protection of vulnerable children is vital and child protection procedures must be effective and work consistently across organisational boundaries. 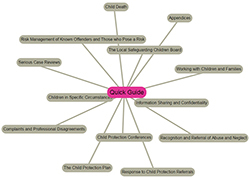 Brighton and Hove, East Sussex and West Sussex Local Safeguarding Partners have commissioned the policies and procedures in this manual, which reflects a significant consensus about best practice across the 3 areas, and all those agencies in Sussex that contribute to the prevention, detection and investigation of abuse or neglect, risk management of offenders and the support and treatment of those affected. 1.1.5 The Pan Sussex Procedures Sub-Group will continue to keep these procedures under review to take account of changes in legislation, government policy, research findings and professional experience. The development of the procedures manual is one of the core functions of the safeguarding partners in their role to coordinate local work to safeguard and promote the welfare of children. 1.1.7 The procedures encourage close working between agencies to facilitate early intervention in a supportive way to meet the needs of children and their families. The manual complies with current legislation together with other government statutory guidance and expectations, and reflects accepted best practice. Further development is required with regards to Working Together to Safeguard Children 2018. 1.1.9 The Policy Framework chapters within which all procedures should be read are set out in Section 1 of the Manual.� All users should be familiar with these chapters before accessing other Parts of the Manual. 1.1.11 If necessary, agencies may develop supplementary 'internal' policies which represent higher standards or which reflect an agency-specific contribution to child protection. 1.1.12 In order to maintain the strategic advantage of a Sussex approach, any such supplementary policies should be consistent with those in this manual. 1.1.13 Procedures indicate what must or may be done in specified circumstances and define the limits of professional discretion. 1.1.14 For staff in those agencies that formally adopt them, these procedures have�the status of instructions and any inability or failure to comply with them should be accompanied by a brief explanation. 1.1.15 Any supplementary internal procedures developed by agencies should also refer to, and comply with these procedures. 1.1.16 It is anticipated that these procedures will also inform and support effective collaboration with the large number of non-statutory agencies and organisations and individual professionals whose contributions also assist in safeguarding children in Sussex. 1.1.17 Guidance provides contextual information or addresses the question of 'why' specified actions may be required. 1.1.18 This manual has included guidance only to the extent that it is required to understand a procedure and facilitate day-to-day practice. The inter-relationship of law, policy, guidance and procedures is represented diagrammatically below. The contents of this manual are for application by those working, whether paid or unpaid, in safeguarding partner agencies and in private or voluntary sector organisations with responsibilities for children living or present in the Sussex area. Where safeguarding partner agencies commission services from private or voluntary organisations, they should seek to make compliance with this document a contractual requirement. This page is correct as printed on Tuesday 23rd of April 2019 03:24:50 PM please refer back to this website (https://sussexchildprotection.procedures.org.uk) for updates.